The internet is great and all—and certainly there’s plenty of information here—but sometimes you’ve just gotta have a good homesteading of garden book. I love having a shelf of books to refer to when I have a problem in the garden or simply need inspiration. I’ve been reading books to inspire my lifestyle lately and these really impressed me. 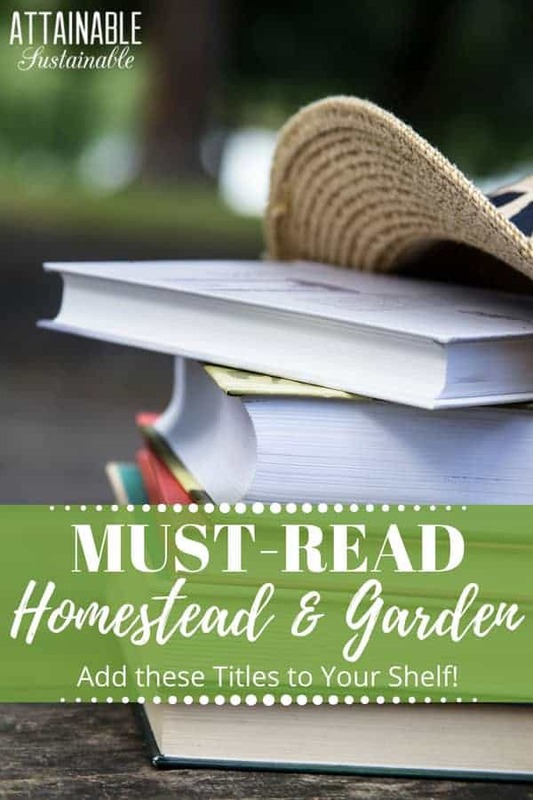 Here, I give you a collection of books that new homesteaders and those just dreaming of the lifestyle will find inspiring and educational. Not to mention fun to read. The idea of creating a productive urban farm in the less desirable parts of Oakland, California is mind boggling to me. But while the location freaks me out a little – I’ve been lost in the seedier parts of Oakland. It can be a dicey place. – the story is an honest look at the author’s efforts to raise her own food. It’s not always pretty, but her determination and resourcefulness move her toward her goal and will certainly give those interested in adopting this sort of lifestyle an intimate look at what it’s like to raise poultry in a small space, scrounge for materials, and create something from nothing. 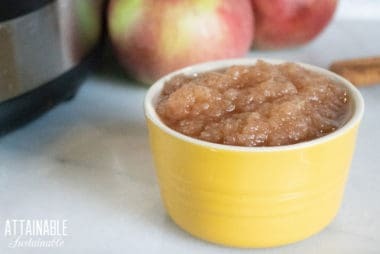 I’ve read it, and honestly, it was one of the things that pushed me into seriously starting our homesteading activities. I always wanted to get back to this lifestyle, but didn’t’ think we could in the city. Her book changed that mindset for me. 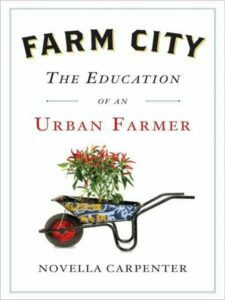 The author has just released a second book, The Essential Urban Farmer, co-written with Willow Rosenthal (who makes an appearance or two in Farm City). Adding that one to my wish list immediately. 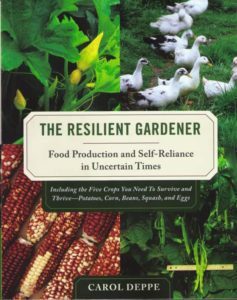 Years ago someone told me about this book, describing a Martha’s Vineyard woman who had dealt with plumbing issues by tossing urine out into her yard, only to discover that the plants that had been alternatively watered thrived. It sounded interesting to me, but life intervened and I forgot about it. I told her that I wasn’t familiar with it, and she went on to describe a woman from Martha’s Vineyard who accidentally discovered that urine was a great fertilizer. Oh, yes! I had heard of that book! I borrowed her copy and discovered an entirely alternative method of living. And I’m not just talking about pee. Martha’s Vineyard gets cold in the wintertime, complete with snow and blizzards. But the author’s greenhouse maintains a balmy temperature all winter long without the use of a traditional heating system. Solar gain and the warmth of animals in the greenhouse allow her to grow vegetables year round without any energy from the grid. Her “solar dynamic, bio-benign design” offers a better way to live more inexpensively and without leaving a big carbon footprint. The author no longer tosses her urine out into her yard, but she’s designed an amazing system to filter waste and utilize the valuable water without harmfully impacting the water table the way cess pools do. I highly recommend this garden book for a look at someone who’s figured out some innovative alternatives both for city and country living. The author’s website has detailed information about her wastewater systems as well as a fun and telling comparison of two hypothetical cities. At the very beginning of the book, Amy talks about what she calls “the suburban problem” and dispels myths about growing food in suburbia. 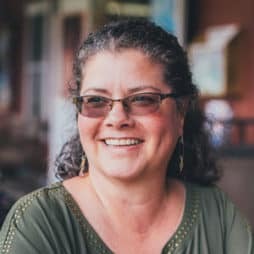 And she discusses the suburban micro-farm as a solution to increasing food production in this garden book, with a focus on permaculture techniques. But she doesn’t just discuss the idea. There are detailed instructions for improving soil, extending the season, and raised bed gardening. The book is divided into three sections: Getting to know the micro-farm; becoming a micro-farmer; and advanced micro-farming techniques. Joel Salatin is the visible face behind Polyface Farms. Michael Pollan’s Omnivore’s Dilemma or perhaps you caught his TED presentation (Mid Atlantic). 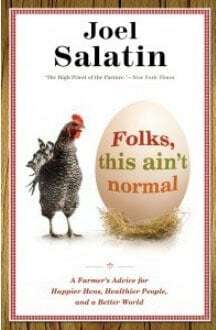 I am a huge fan of Salatin, so it’s no surprise that I loved his book in spite of his occasional crotchety outbursts. He’s a wise man who is willing to say some of the things that other people just won’t. First and foremost in this book is the fact that our food system, one that trucks and ships and flies our food thousands of miles just ain’t normal. Salatin covers the politics of food, but he also spends a lot of time discussing what works on his farm and why community based food sources make so much sense. The book will likely anger you when you read about some of the difficulties that farmers face in bringing good, wholesome food to the table, but more often, I think it will inspire you to make changes in the way you source your food. Maybe that’s growing your own or seeking out a CSA or local farmer. You can see Mr. Salatin in action, talking about his pigerators and other topics on the book’s website. For years, my plant bible has been the Sunset Western Garden Book. Filled with listings of specific plants (over 8,000 in the 2011 edition) that detail plant characteristics, growth habits, and zone requirements, this is a must-have if you garden in the west. The book includes information about both edible and ornamental plants and trees. Of course, this is region specific and works for me; if you’re east of the Rockies I’d love to hear about your favorite regional reference book. If you are one of those people — as I am — who likes to use scrounged materials to create new things, you’ll love this book. In it, the authors give easy to follow, step-by-step instructions for creating a homestead on a tight budget. With projects like an inexpensive DIY Berkey-style water filter, a bicycle wheel water lifter, and a solar water pump, this book is a must-have for your bookshelves. 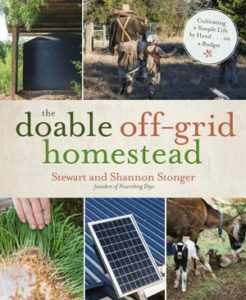 Read more about the book and see some of the projects in action on the authors’ off grid homestead here. In this book, the author chronicles her family’s year of eating only homegrown food (supplemented by locally grown products, on occasion). It’s an inspiring look at the possibilities of living self-sufficiently. I particularly loved reading that even though this was her idea, even though she wanted to live this way, it was hard for her to actually begin. She worried that the spring months would offer spare produce for her family’s table, and she was right. I found reading about her choices in sustainable living to be an education in itself. This title may seem like an odd choice for a sustainability site, but the images in the book are a visual reminder that the way we eat in industrialized nations is far from sustainable. The book features photos of families from around the world in their kitchen or eating area, surrounded by the food they will eat in a week’s time. Compare an image of an American family seated amid takeout pizza, potato chips, and Coffee Mate with that of a family from Chad sitting proudly with bowls of grain, freshly butchered chickens, fruit and vegetables, and milk from the family cow. The sustainability and nutritional value of food eaten in our wealthy nation pales in comparison to the food served in some of the third world countries pictured. How did we become so far removed from our food?? Some of the photos from the book are featured in this TIME magazine photo essay, What the World Eats. I’ve had this book on my shelf for years. My kids call it my “woo-woo” book. It’s filled with alternative remedies for all kinds of ailments. From insomnia to athlete’s foot, the book suggests treatments from herbalism and aromatherapy to homeopathy and vitamins. When we have a non-emergency health problem, it’s a great resource. Despite the slightly ominous title, this is not a book about calamity and strife. It’s a garden book—simply—about being self-reliant, growing your own food rather than leaving that responsibility to the local supermarket. I loved this book. Really loved it. It’s chock full of information and at the same time takes readers on a wandering tour through the author’s farm and garden. The author’s tips, randomly interspersed throughout the text are invaluable. This isn’t a book to quickly skim; I found myself reading every single word, just to be sure I didn’t miss a valuable nugget of information. This comprehensive guide to old-fashioned living is a MUST on your bookshelf. 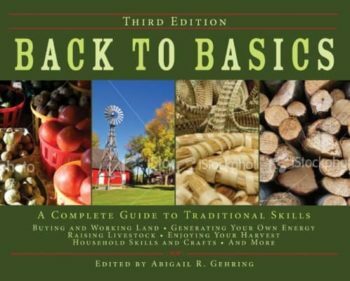 It’s chock-full of information on skills needed for a homesteadish life. If you’re trying to figure out where to start in your homesteading adventure, this book will give you insight about what’s possible. A first-hand account of the author’s attempts at living a more self-sufficient lifestyle, this book is a fun read. Bucking the system and learning to grow our own food can have a huge learning curve, depending on your background. Reading how one woman embraces the difficulties and challenges in adapting to an old-fashioned sort of life is inspiring and more than a little bit hilarious. Home ec in schools is a thing of the past, so how are we to learn some of the skills our grandparents knew (but didn’t pass along)? 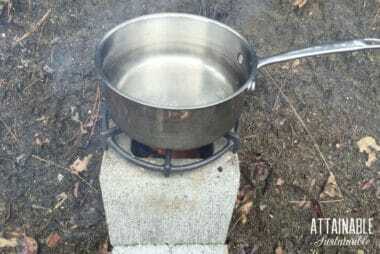 The authors offer up a collection of traditional skills like fermentation, gardening, and beekeeping, but include some unexpected instructions, such as making and using a wort chiller for brewing. Bonus: I love The Harrowsmith Reader. Sadly, it’s out of print and not one that’s easily found, but if you’re a fan of scouring used bookstores for bargains, this is one to watch for. It’s an anthology of articles from Canada’s Journal of Country Living and it’s chock-full of information about independent living. I have the second anthology, covering raising poultry, wind power, ponds, bread making, raising cattle, and more. What have you read lately to inspire a more sustainable lifestyle? Last summer I read ‘Animal, Vegetable, Miracle’ by Barbara Kingsolver (and her family). It was a revelation! Surely a must read for any homesteader!